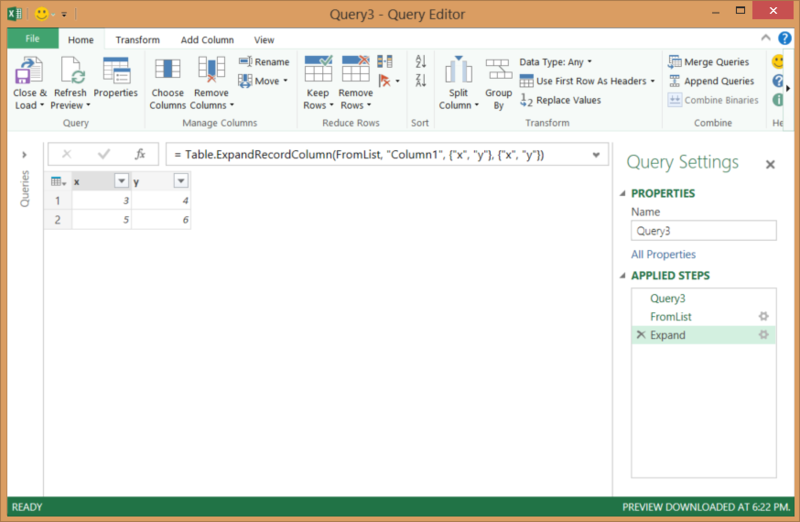 The Power Query formula language (M) contains a number of library functions that allow you to parse binary data. You can use these functions to build queries which parse custom binary file formats. This post contains two samples – a simple query which parses X & Y coordinate values from a binary field, and a more advanced query which reads PNG file headers. The following query defines some binary data (Source), a record format (PointFormat), and a parsing format definition (FileFormat). The #binary function lets you pass in a list of byte values. Here we have specified a total of 12 bytes. PointFormat defines a record format with two BinaryFormat.SignedInteger16 fields (2 bytes each), x and y, for a total of 4 bytes. The first argument to the BinaryFormat.Choice function indicates that we should read the first 4 bytes (the size of an BinaryFormat.UnsignedInteger32). This value is read and passed in as the count parameter to the BinaryFormat.List function. BinaryFormat.List ends up reading the remaining 8 bytes of the binary (count * sizeof(PointFormat)), and outputs a list of records. This sample is provided as an exercise to the reader to understand. To test it out, replace the path value in the call to File.Contents.